We incorporate a research-based educational methodology in everything we do, from the needs assessment stage through to program development, delivery, and evaluation. This comprehensive evaluation framework, which measures program and performance outcomes, is a critical element in high-risk activity education. As part of Ontario's health and safety system, we are recognized by the Ministry of Labour, the Ministry of Transportation, the Ministry of Advanced Education and Skills Development, and the Workplace Safety and Insurance Board as designated trainers and consultants. So, you can be sure that the training you get from IHSA meets regulatory requirements and compliance standards. Safe and healthy workplaces free from incidents, injuries, illnesses or fatalities. To be Ontario’s trusted health and safety resource for effective sector-specific engagement, education, products and services. We remain committed to providing you with world-class service and the information you need to prevent occupational injury and illness. The Board of Directors and management of Infrastructure Health and Safety Association (IHSA) are committed to the prevention and elimination of occupational illnesses and injuries and the support for mental wellness in our workplace. The Board of Directors and management of the Infrastructure Health and Safety Association (IHSA) recognize the potential for workplace violence and harassment and are committed to working with employees to provide a safe and respectful work environment. 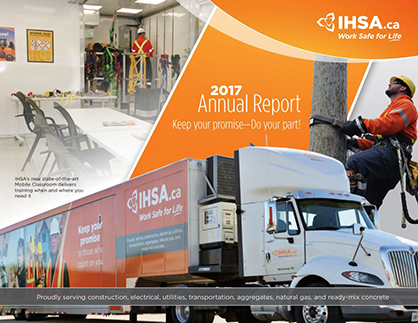 Download IHSA's 2017 Annual Report and financial statements. To download a copy of our expense policy, click here. Tom Lachance – TESC Contracting Company Ltd.
IHSA works closely with its industry partners and labour associations through its Labour-Management network, its industry-based Advisory Councils and its two Provincial Labour-Management Safety Committees and Section 21 Committees (construction and electrical respectively).